Construction's challenge of improving efficiency and productivity, and attracting a new generation of tech-savvy workers and disruptive thinking management, can be addressed only by building a powerful innovation ecosystem. 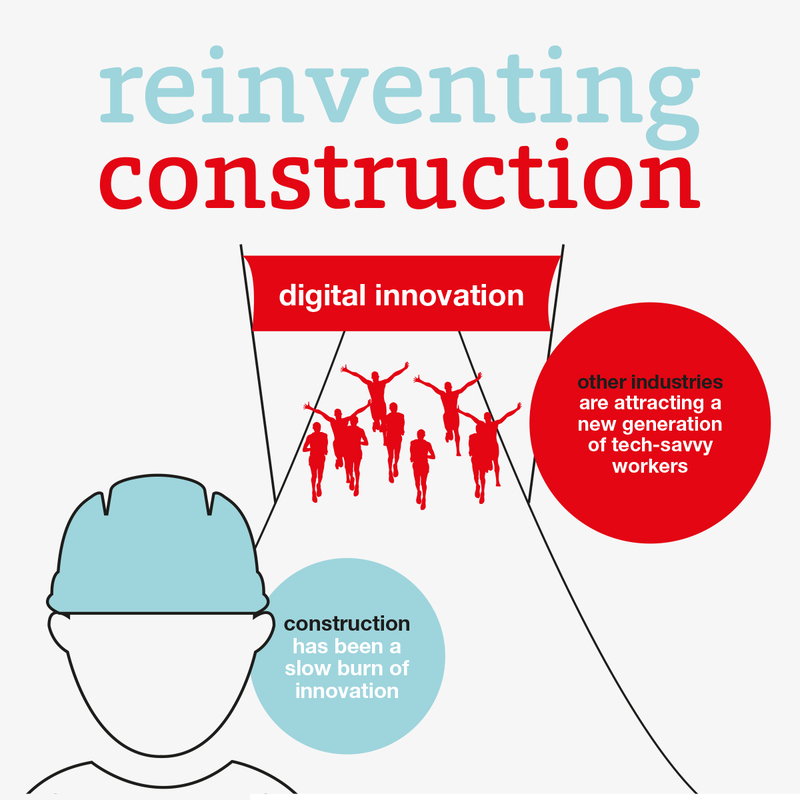 Our aspiration should be to reinvent construction as an innovation industry. But look at construction's track record. The second least “digitised” business sector currently (after agriculture) and the least productive of any industry. What is getting in the way? It is often said that construction innovations are not disruptive. They are often first to construction and not first to other sectors. Also, construction has an image of technophobes with low productivity and limited innovation. Disruption just seems like a bridge too far for an industry with a high dependency on low cost, semi-skilled labour. When we hear people talking about disruption, we tend to think about sectors such as automotive, finance, media, travel etc., but not construction. We look to the likes of Uber, Airbnb, Snapchat, Zopa - brands that turned their industries upside down - but we rarely look inside our own industry, because we can't see how or where similar disruption can happen, although they said the same thing about other sectors. Not many people predicted the arrival of innovative Intel processors in the Eighties, which disrupted office work. It was the same a decade later, when Amazon reinvented the concept of shopping, and Ryanair and EasyJet disrupted air travel. But innovation is rational and even if people have initial reservations, they invariably get how it could work. Disruption, however, is irrational, and the idea does not sit comfortably in an industry that is often reluctant to innovate and resistant to change, and is also traditionally slow in introducing new skills and technology. Nonetheless, one can easily see how technology such as automation and robotics has huge disruptive potential within construction - and digital techniques and tools are becoming more widely available. But where is the average construction company sitting in that? If we want an industry that embraces innovation, there needs to be a combination of client demand and contractors willing to change and invest. Disruption, meanwhile, is an entirely different matter. One could argue that construction has been a slow burn of innovation - change that has taken place slowly over time, and has allowed for gradual development of materials, methods, products, procedures etc. Disruption, however, is a change to the market that is so powerful and different that it requires others in the field to follow suit or be left behind. It's hard to see how construction could "do a Netflix" for example - completely changing a market, with its on-demand subscription model, accessible from the comfort of our own homes, and ultimately putting Blockbuster out of business. Or adopt the irrational mind-set of Uber, asking ‘What if I could get everyone in London to be a taxi driver?’ and then apply technology to achieve that. It is difficult to disrupt an industry that is extremely cautious by nature and highly restricted by client demands. Disruptive innovation needs collaboration and organisation, not just fantastic ideas. But construction arguably needs to both innovate and disrupt if it is to have any chance of fixing its productivity, sustainability, and skills issues. Maybe the answer is in start-ups, whose products and services could deliver those disruptive innovations, although technological advancement without practical experience can create solutions that don’t deliver or integrate. We need both the government and industry leaders to embrace the potential transformative benefits of innovation and help deliver a standardisation of digital tools and methods, for example, which not only have huge disruptive potential, but can also help construction compete alongside other industries for the best talent.